Its origins are found on the hard courts of basketball; its strategy based on the simple mathematics of the 2-on-1 fast-break. Football’s most dangerous play was first conceived by Dan Faurot back in the 40’s while watching a game of round ball. What he saw was that, in a 2-on-1 fast-break, the lone defender was placed in a no-win situation. He had to make a split-second decision who to defend to prevent a score: either the ball handler or his teammate running along side but some distance from him. Spacing, Faurot noted, was critical. If the defender chose to guard the ball handler, then the latter passed the ball off to his teammate who would drive to the goal and score. If, however, he defended the player without the ball, then the ball handler would simply drive to the goal and score. Whichever option the defender chose, he was wrong. It is the same with Dan Faurot’s creation: the option play. In the 2-on-1 fast break pictured above, the ball handler has driven past the defender (in white) and is on his way to the goal to score. 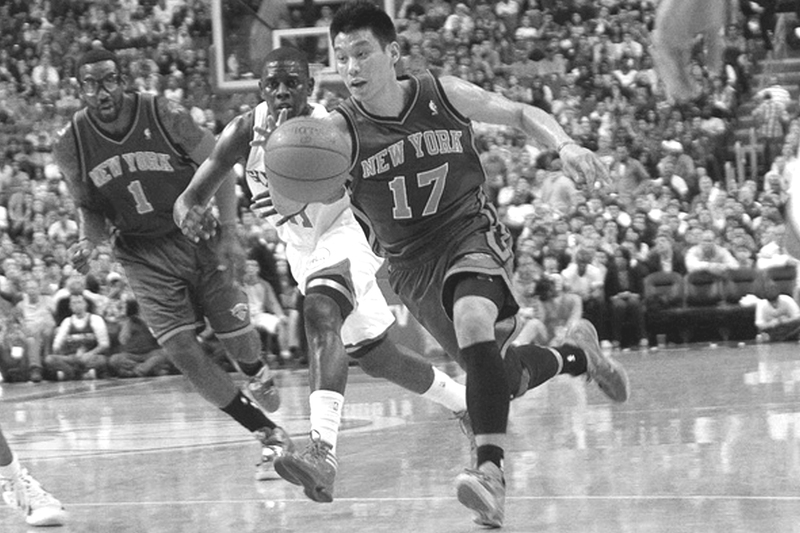 The core principle of an option play, like the fast-break, is to isolate a defender and force him to choose which of the two offensive players attacking him to defend. It makes no difference what type of option is being executed or discussed, the principle is the same for all option plays. The only difference between the many types of option plays is which defender along the line of scrimmage is isolated and how. Now by “isolated” we mean “unblocked”. The blocking by the offensive line is schemed in such a way that the isolated defender is “read” by the quarterback. That is to say, the unblocked defender’s actions are instantly analyzed by the quarterback who either gives the ball up to another running back or keeps it himself. 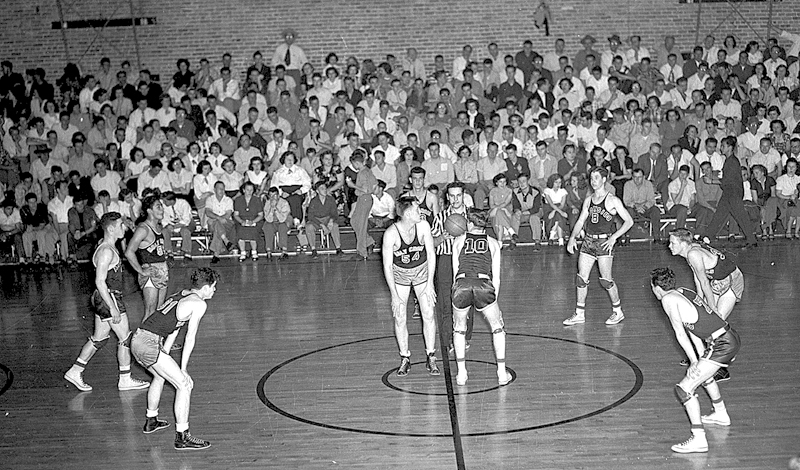 Pictured above is a 2-on-1 option play. 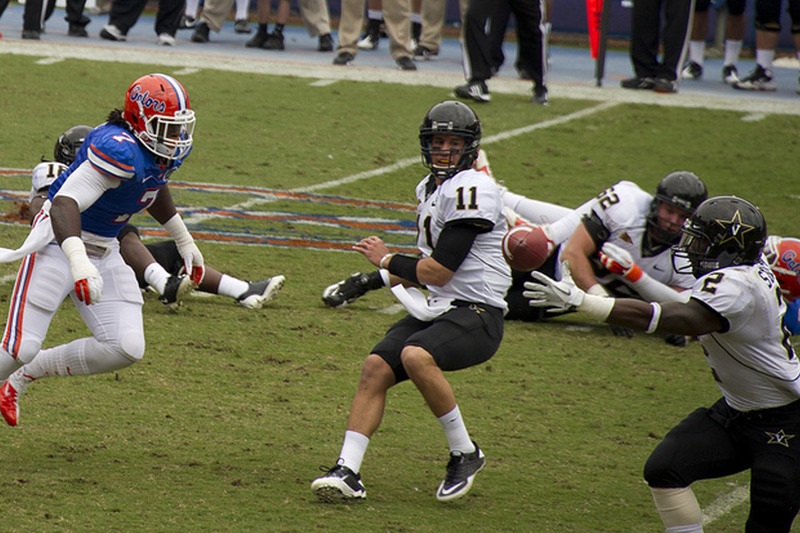 The “isolated” defender (dark jersey) has chosen to attack the quarterback (#11) who, because of it, has pitched the ball to the running back trailing the play. Proper spacing between the quarterback and the running back prevents the defender from changing direction and attacking the running back. He must choose one or the other; not both. While there are several types of option plays, there are only two option concepts: the double option which is a 2-on-1 scenario and the triple option which is a 3-on-2 attack. What these two methods of attack do that most traditional running plays don’t is use the quarterback as a ball carrier. In a game whose strategies are routinely based on mathematics, the defense must now account for all 11 offensive players and not simply 10. This is instrumental to the success of the option because, in all situations, the targeted defender — or defenders — must believe that the quarterback is a running threat, otherwise there is no option; hence no danger. By threatening defenses at more than one point along the line of scrimmage, the option play forces defenses to be assignment-sound and gap conscious, which routinely negates their speed, size and tactics. It also doesn’t require large and dominant offensive linemen to be successful because the linemen don’t have to sustain their blocks. They merely seal off or cut block defenders, so it is popular with teams, like the service academies, that have undersized linemen. And it is difficult to prepare for in a week’s worth of practices as scout teams can rarely mimic the speed and execution of a well-drilled option attack. Put simply, an option play is the best way to attack a defense, especially its perimeter where it is weakest. 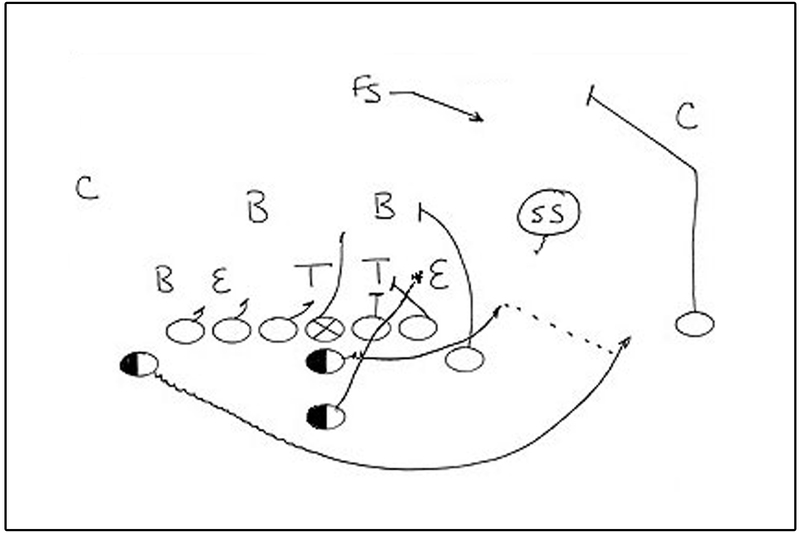 The triple option play diagrammed above is a 3-on-2 attack. Three potential running backs are attacking two unblocked defenders: the defensive end (E) and the strong safety (SS). This particular option play is designed to attack the perimeter where the defense has only two players who can stop the play and one of them, the strong safety, is being optioned or “read”. The remaining player, the cornerback (C), must make the tackle and even if he does, the offense will gain significant yardage. While the deep pass might be football’s most spectacular – if not most feared — play, defenses don’t see it every play. The option is football’s most dangerous play because it is almost impossible to defend and it is a threat to go the distance any time it is run which, against an option team, is every play except when they choose to pass, which is rare. So why don’t we see the option run in the pros more often? The reasons are simple. For one, the speed and athletic ability of the pro athlete is world-class. Put eleven of them on defense and the option is more easily defended than in high school and college where the abilities of the players are noticeably unequal. The other reason and most importantly is money. Most pro coaches are reluctant to expose their multi-million dollar quarterbacks to season- or career-ending injuries, especially since great, even good, quarterbacks are few and far-between. It was once said that you might see young running quarterbacks in the pros, but you’ll never see any old ones. 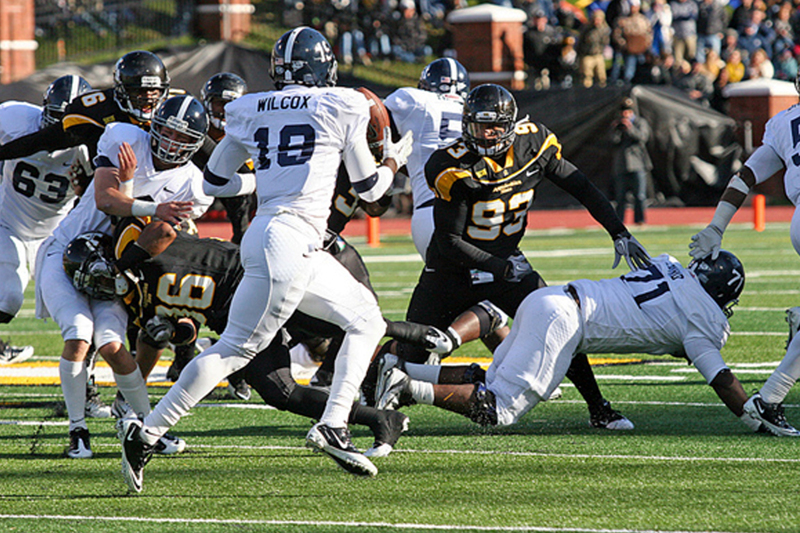 In an option offense, quarterbacks, like the one in the picture below, get hit hard and often. One devastating hit can end a promising career and derail a money-making, championship season for a pro team.